What I remembered from medical school is that if you cut the carbs out of your diet, then all of your metabolism turns backwards. Basically in medical school you are taught that your metabolism works this way (from top to bottom). Diagrams start at the top and they go down. So if you stop eating the carbs then the diagram goes up. Things turn around, they go backwards, like a cycle. But I didn’t! After I lost that 30 pounds and then stopped going to the gym, I lost an additional 10 pounds, to make a total of 40 pounds. So I lost 40 pounds, and I was worried at some point, “What if I waste away?” What if I go down to 160, 150, then 130 and I become skin and bones. But I just stayed at this there. 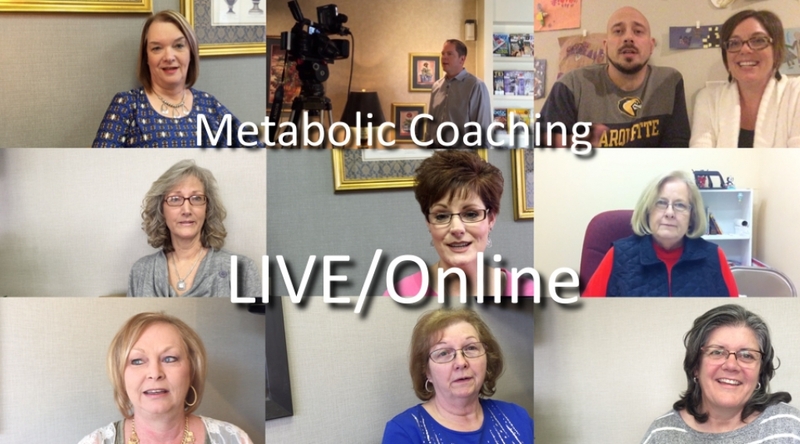 I remembered this, that your metabolism can go backwards, but I didn’t remember them telling me that if your metabolism is running backwards then your blood pressure will improve and all these other things will improve. So I started reading a lot of books about weight loss. So here’s my blood pressure. This is actually a different scale. This is the scale at the doctor’s office. My weight in 2011 is 209 pounds, and 2013 it is 169 pounds. So either way you count it, I lost 40 pounds. My systolic blood pressure was 142, and then in 2013 it was 126. And one of the points of this seminar is that those results were achieved without drugs. In medicine we are trained that “This is a disease. And if you have a disease, then we have a treatment for it.” And a lot of times the treatment involves medications, and there are lots and lots of medication that we can give you. But this is without drugs, this didn’t cost me anything. This didn’t cost me a prescription copay every month for 2 years to get my blood pressure down and keep it down. And this is one of the key realizations that I had, and that I want to share with you. Your body is perfect. 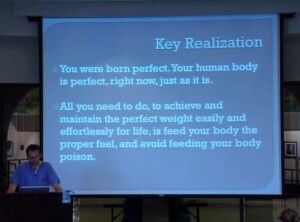 Your human body is perfect, right now, just as it is. 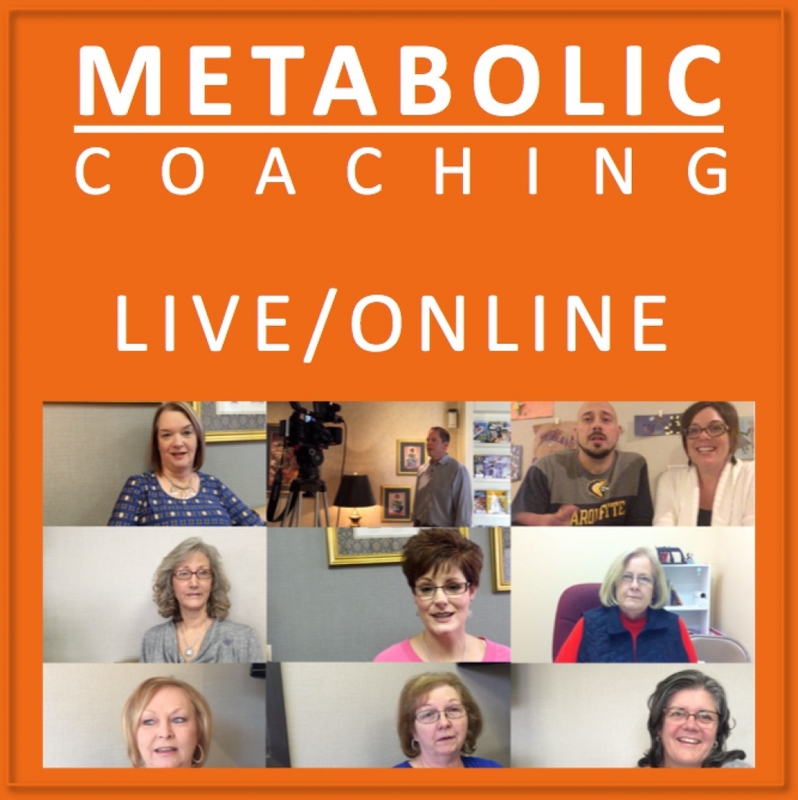 All that you need to do to achieve your ideal weight, and to improve your health, and to maintain that ideal weight for life, is to feed your body fuel that it understands. There are certain fuels that your body just does not understand, and those are the refined carbs. 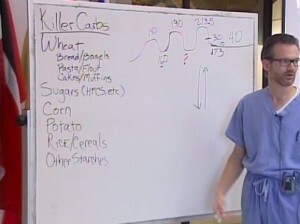 That’s what’s on the list on the white board, the Killer Carbs, and we’re going to refer to that list a lot today. What are the refined carbohydrates? Essentially they are anything that comes out of a machine, anything that is made out of flour, anything that contains processed sugars, and cereal grains such as corn and rice. Those refined carbohydrates are essentially new additions to the human diet. They weren’t a part of the human diet for most of human history (well, pre-history since most of it wasn’t written) – meaning for most of human existence. So for that reason, your body does not know how to process those foods. Your is a well-tuned machine with just millions of chemical reactions going on every single second of every single day. But when you feed it these processed carbohydrates, it just does not know how to handle those things. Those are foreign material. So, if you are unhappy with your body, just remember, it’s perfect. Now lets take a few minutes to discuss medical education. In medical education are taught lots of pathology and pharmacology. Pathology is the study of disease, we spend semesters on that. Pharmacology is the study of drugs, we spend semesters on that too. But we are only taught nutrition for days to weeks, not semesters. So don’t blame your doctor for saying, “Oh, you’ve got diabetes, so you’ve got to take these pills.” Because he wasn’t really trained and taught these things. If I had been taught these things in medical school, I would remember. The one thing we were taught in medical school was the Whole Foods Diet. This diet recommends that you need to eat foods that are more whole and less processed. And that makes a lot of sense. Where you get into trouble with that kind of diet is when you think things like: White flour is very processed. Wheat flour is less processed. So wheat flour is more whole and must be good for me. Flour, altogether, whether it is white or wheat, is going to raise your blood sugar and is going to put weight on your body. We’ll talk about that more later. In medical education we are taught that obesity (which is defined as being a certain amount overweight) leads to these other diseases. That is to say that the patient’s are first obese (overweight). And when they are obese (overweight) it leads to these other diseases such as diabetes, and heart disease, and even acid reflux disease and high blood pressure, sleep apnea and it’s associated with certain types of cancers. But what we are going to talk about in this conference is that obesity is just another one of these symptoms. It is just one more symptom in this whole syndrome of diseases that all run together. The cause is insulin. 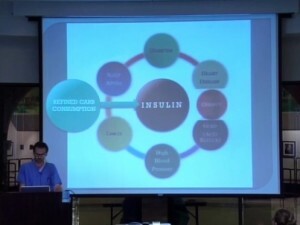 And what causes the insulin to be high? Eating refined carbohydrates.